Everything you feel or do is the result of the activity of nerve cells throughout your body. Feel cold? That is the result of a nerve signal between your body and brain. Hungry? Your stomach communicates with your brain along nerves that connect the two organs. Even when you turn a page in this book, the muscles in your arm and hand are being activated by signals carried by nerves connecting those muscles to your brain. All organs are composed of different types of tissue and these tissues are composed of many individual cells. In the brain, tissues are composed of neurons, a unique and very special type of cell. The brain is almost entirely made up of different types of neurons (or nerve cells), and these cells also run throughout your body, connecting almost every part of your body to your brain. There are many different types of neurons depending on where the cell is located in the body and exactly what it does. Luckily, all of these different types follow more or less the same basic structure, so you don’t have to get lost in all of the details. Neurons look a lot like trees and have three primary parts: a cell body, many branchlike extensions that grow off the cell body called dendrites, and a long trunk-like extension of the cell called an axon. The cell body is responsible for keeping the cell alive and acts as its control center while the dendrites receive connections from other cells. 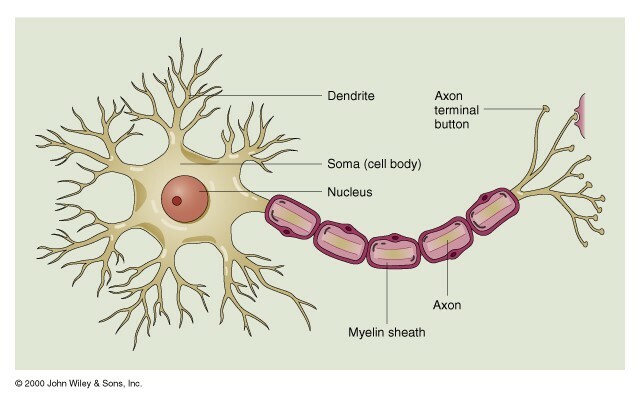 The axon connects the neuron to other cells and can be very, very short, as in adjacent neurons in the brain, or extremely long, like the neuron that connects your big toe to your brain through your spinal cord. Neurons can connect to other nerve cells or to completely different cell types like muscles, glands, or organs.